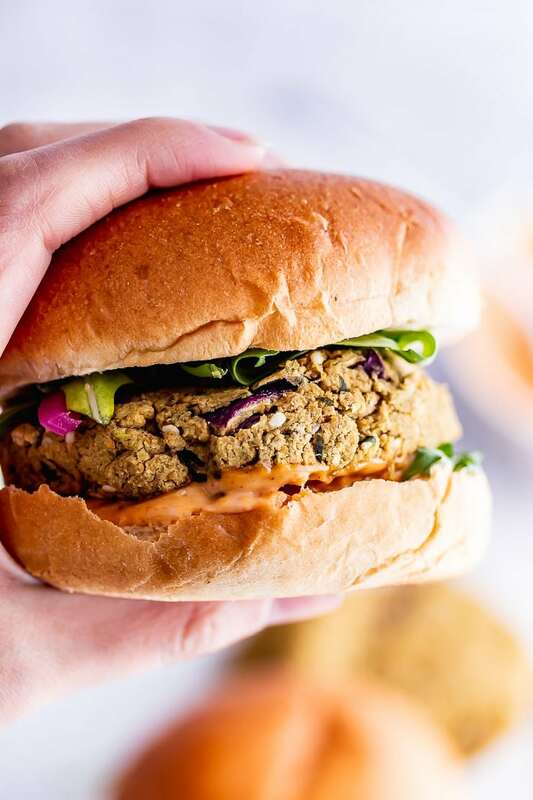 This baked falafel burger is a healthy vegan recipe made with chickpeas and spices and served with a spicy chipotle mayo sauce. Plus they’re so easy to make! 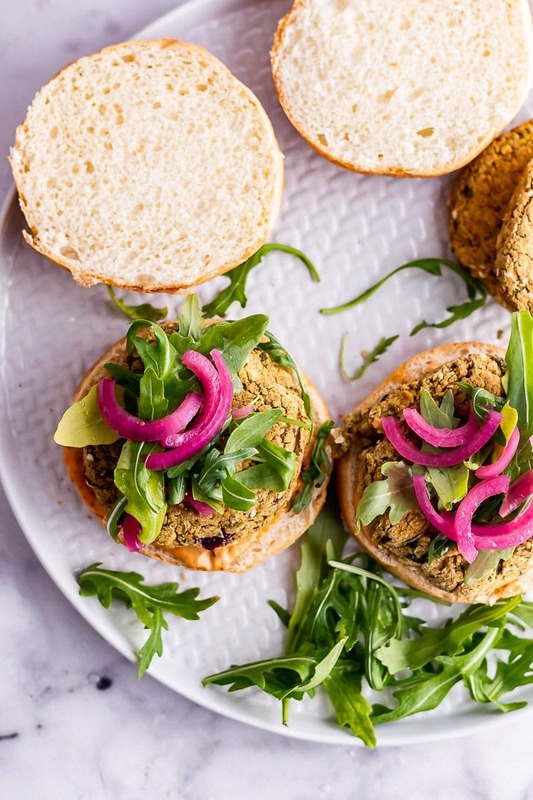 Healthy and so easy….I am in love with these falafel burgers! 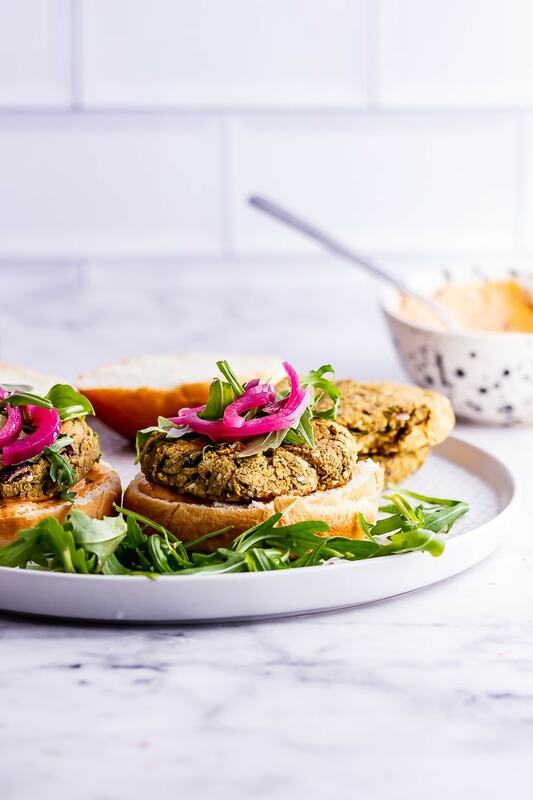 I’ve been meaning to try making falafel burgers for so long. 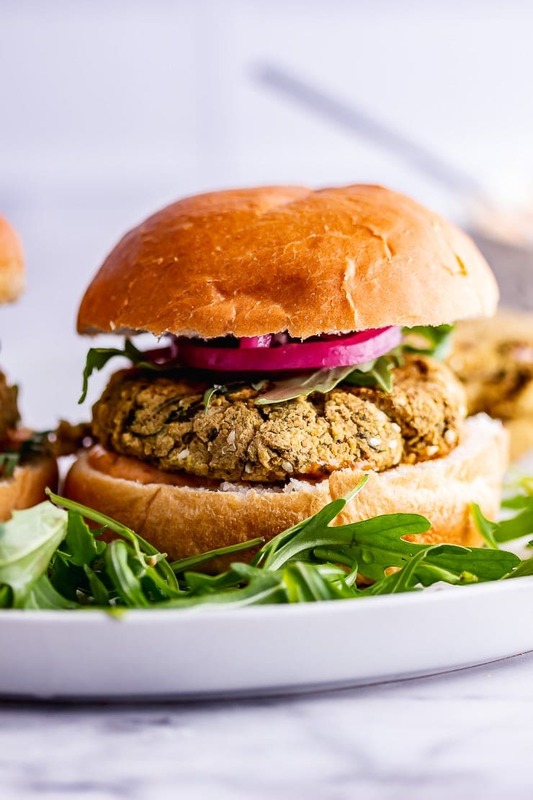 Ever since I first tried making falafel from scratch I knew that it would taste amazing in a burger mainly because there are very few things that don’t taste better sandwiched between two slices of bread. 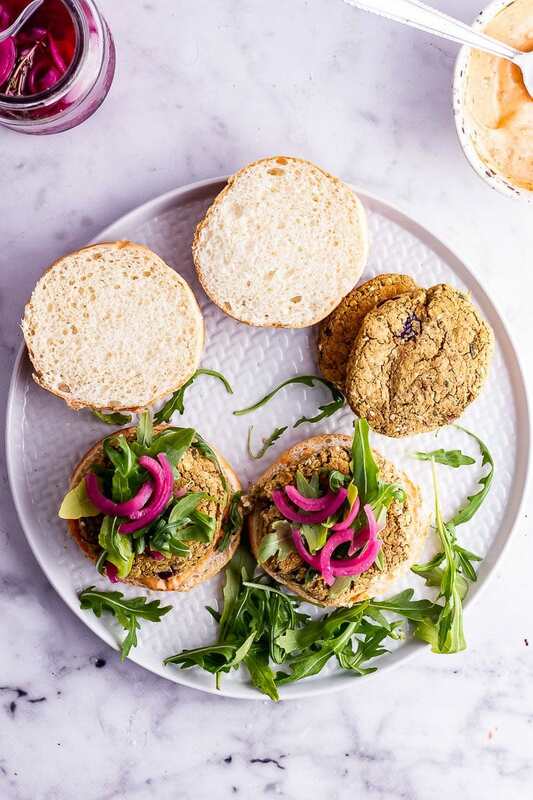 This recipe is really very similar to my herby baked falafel but it’s slightly firmer which makes it perfect to serve in burger buns like I have here. In terms of toppings I went with a super simple chipotle mayo (use vegan mayo if needed), rocket and more of my super quick pickled red onions which I’ve used on pretty much everything I’ve eaten recently. If you want to make your own batch then find the original recipe is this spicy tofu sandwich post. 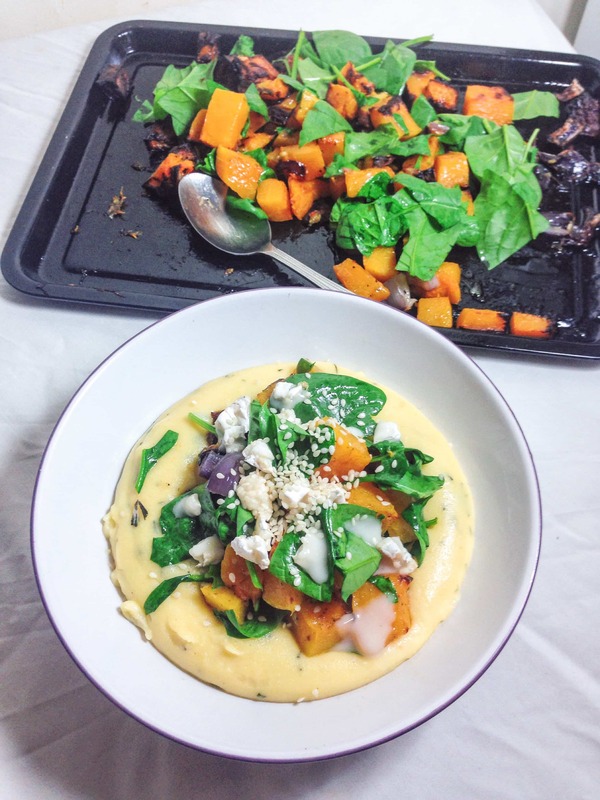 Finally, this recipe is pretty versatile so if you want to try different combinations of spices or different toppings or sauces then go for it! 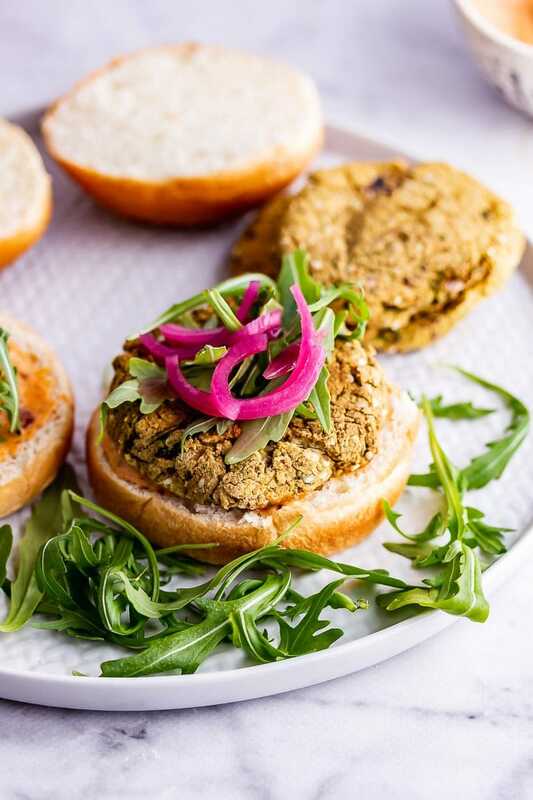 Blend the burger ingredients: Put the chickpeas and sesame seeds in a blender until it’s a paste then add the garlic, red onion and coriander and blend until mixed. Make the burgers and mayo: Tip the mixture into a bowl and add the flour and spices and mix then shape into 8 patties. Mix the mayo and chipotle paste. Bake and serve: Put the burgers in the oven then once they’re cooked serve with your choice of toppings. Want more? 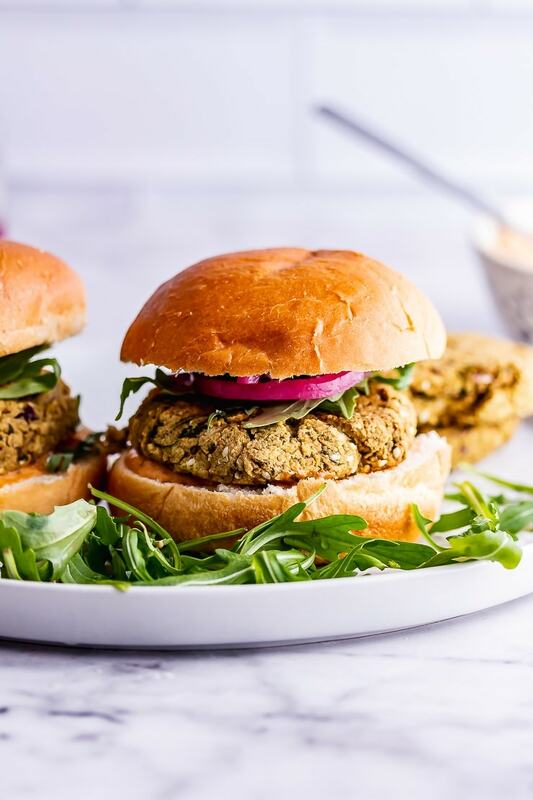 Try these other burger recipes! Heat the oven to 190°C/375°F. 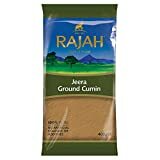 Put the chickpeas into a blender with the sesame seeds and blend until you have a paste then add the garlic, red onion and coriander and blend again until everything is chopped. 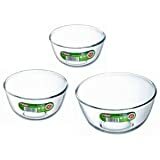 Tip out into a large bowl. Add the flour and spices and season well then mix before shaping into 8 patties. Place the burgers onto a lined baking sheet and put in the oven for 30 minutes, flipping halfway through. Mix the mayo and chipotle paste together adjusting the amount of paste according to how spicy you like it. 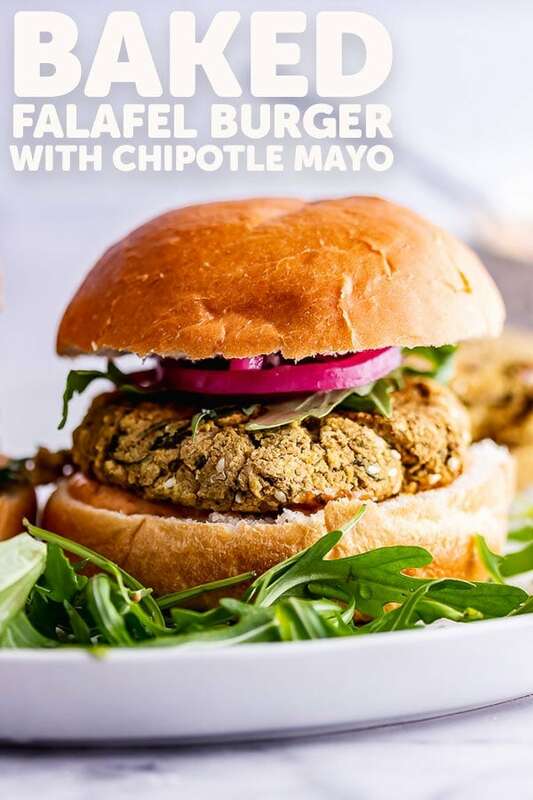 Spread the mayo on the burger buns, top with a falafel burger, rocket and pickled onions if you like. Nutrition information is per burger and is an estimate and will vary depending on the ingredients used. 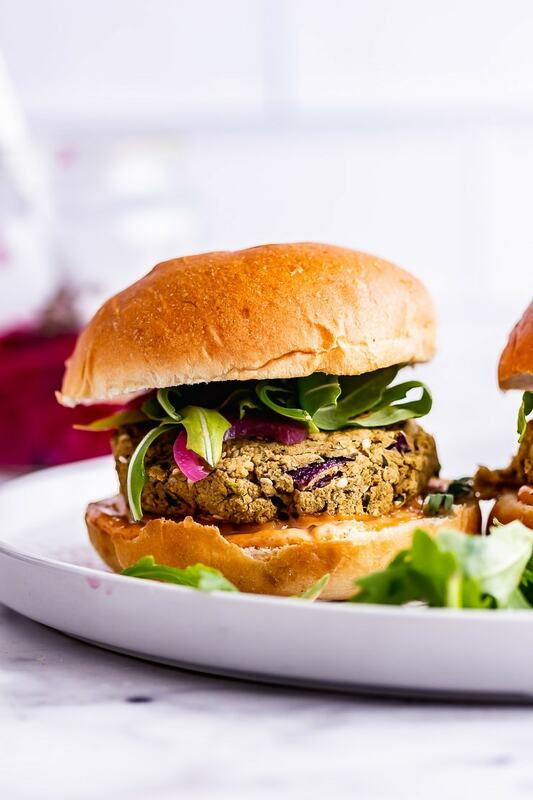 These burgers look super fantastic! 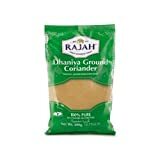 I did have one question when you say, Coriander it’s the leaves? Or the seeds? 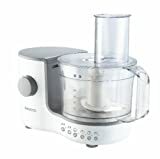 I just want to make sure I properly make your recipe. I am making this recipe this weekend so please let me know. I am super excited to try it. Oh ya! This sounds so good. Making it tonight, thanks! I love falafel as well. Never thought to make them as burgers. Great idea! Perfect for meatless Mondays and days of abstinence too! 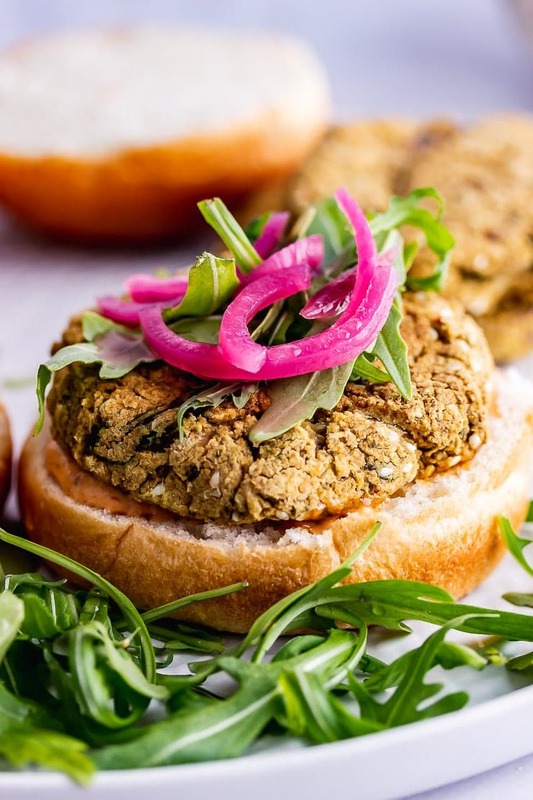 What a great alternative to a bean burger. 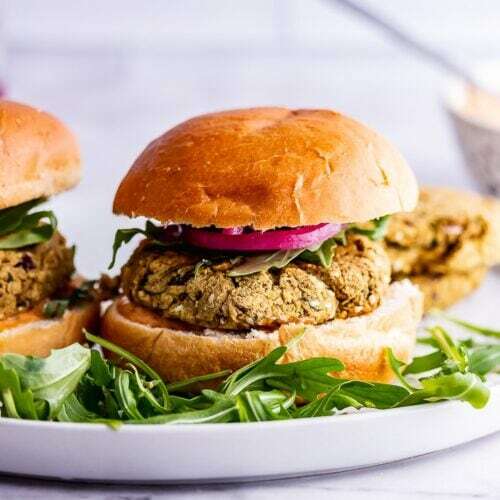 Black bean can get old but I love the idea of a chickpea burger with all those aromatic spices and ingredients for something different and tasty. Love this idea! 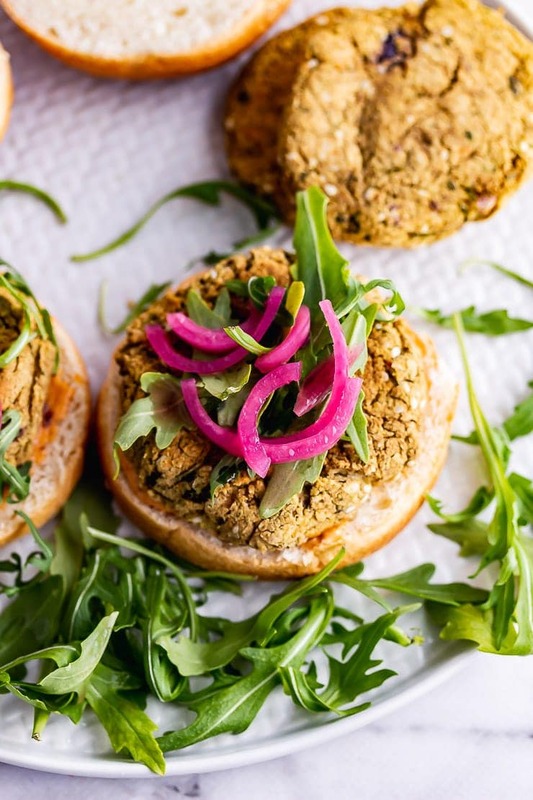 I love the idea of baking the falafel! Such a healthy way of making a burger. I love your photos too.